The 2017 Four-State Dairy Nutrition and Management Conference will be held on June 14 and 15 at the Grand River Center in Dubuque, Iowa. This premier conference will focus on nutrition and management topics to improve cow performance, and foot and cow health. This conference is a collaborative effort of Iowa State University Extension, University of Illinois Extension, University of Minnesota Extension and University of Wisconsin-Extension. The program starts on June 14 with the Quality Liquid Feeds pre-conference symposium. Dave Barbano from Cornell University will cover how short chain fatty acid content affects milk fat and protein yield. 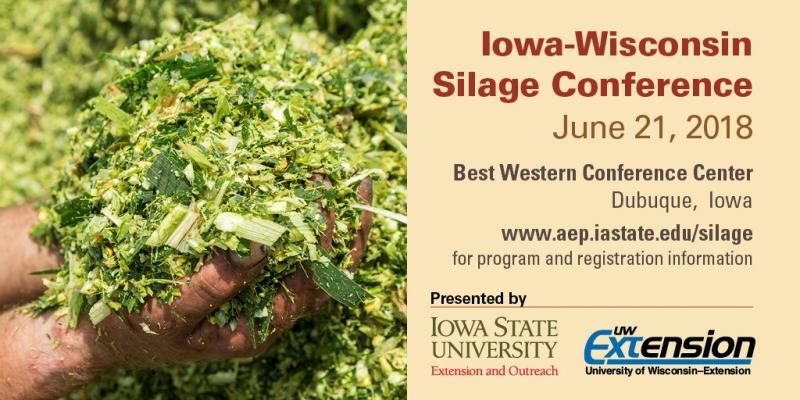 Lance Baumgard, Iowa State University will discuss the effect of leaky gut on transition cow health and using chromium propionate as a mitigation strategy. Other topics include how supplementing methionine during the transition period can enhance health, milk yield and reproduction and final topic is feeding and managing herds for 100 lbs of milk per cow per day. Four State conference speakers include Richard Erdman, University of Maryland, discussing DCAD for lactating cows. Paul Kononoff, University of Nebraska, will talk about the importance of water quality in dairy production. Bill Weiss, Ohio State Univesity, will show his latest research on using TMR sampling to trouble shoot herds. Nigel Cook, University of Wisconsin, will discuss how to prevent lamness in dairy herds and new ways to effectively ventilate dairy barns. Karl Burgi, Dairyland Hoof Care Institue will explain the fundamentals for good hoof health. Pamela Ruegg will share the results of a survey on bedding choice, udder health and production on Wisconsin farms. Are all clays equal? Clay utilization in dairy cow diets. Amino acids; Roles beyond being the precursers for protein synthesis. Feeding strategies and returns for robotic milking systems. Mycotoxins in dairy cattle; Who, What and Why. Producing more milk using more high quality forages. Feeding and management on top producing herds in Minnesota. Can we feed by-products with confidence? Incorporating pen and feed variation into diet formulation. Post-conference symposium sponsored by Mycogen seeds will include Barry Bradford, Kansas State, discussing uNDF and the synchrony of intake, rumen health and microbial production. Greg Roth, Penn State, talking about silage hybrid selection and Kathleen Emery, Mycogen seeds, discussing using CornPicker to economically evaluate silage hybrids. In addition to the educational program, there is a trade show with 50 companies exhibiting their latest products, evening receptions and plenty of time to network with other participants. ARPAS and veterinary CEU credits are available (contact your state veterinary certifying agency). ORANGE CITY, Iowa – Sit down with any Northwest Iowa livestock producer - dairy, swine, beef or poultry - and the topic of labor is sure to surface in the conversation. According to Northwest Iowa Extension Dairy Specialist Fred Hall, everybody has the solution for how agriculture can find and keep a dependable labor force, but each has a perspective for the solution that often doesn’t recognize or jive with the issues identified by employees or employers. To help identify those issues, Iowa State University (ISU) Extension and Outreach Dairy Specialist Fred M. Hall and Human Sciences Specialist in Family Life Lori Hayungs have worked with retired ISU Sociologist Dr. Jan Flora to develop a survey for employees and a survey for employers. Hall and Hayungs are asking farm employees and employers to identify the issues that they believe are most important to bringing employees and employers together for mutually beneficial arrangements and strong communities. The distribution and completion of these surveys is all leading up to the Northwest Iowa Farm Labor Conference on Tuesday, April 17 at the ISU Extension and Outreach Sioux County office in Orange City. The employer track registration will begin at 9:00 a.m. with the program starting at 9:15. Speakers will discuss what community means to immigrants, consistent management practices for people, animal welfare, and creating community for employees in Sioux County. In addition, all attendees will be asked to complete the employer survey during the noon lunch. Employers who are not able to attend, but would still like to share their opinion may also complete the online form which can be accessed at https://blogs.extension.iastate.edu/nwiadairyoutlook/. Once completed, email the survey to fredhall@iastate.edu. The employee track will be presented in Spanish and will run from 6:00 p.m. to 8:00 p.m. on April 17. The evening will start with a light dinner, and the program will start at 6:15 p.m. The discussion will focus on how immigrants understand community, and how employers can build consistent management practices for people that protect both employees and supports animal welfare. All employees will be asked to complete a survey. Proctors will be available to assist, if needed. Neither the employee or employer program has a registration fee, but pre-registration is required to ensure that enough meals are provided.